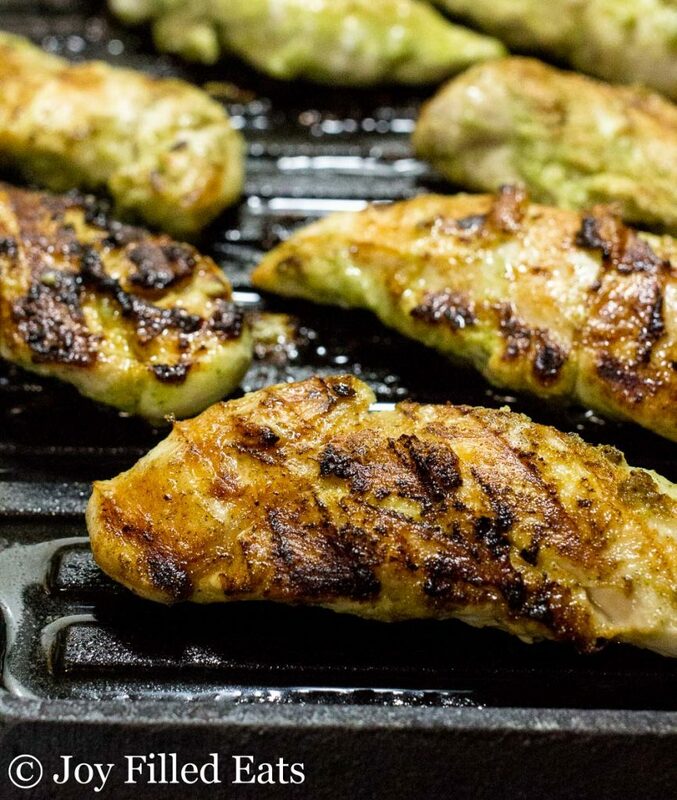 One of my favorite ways to liven up chicken is to use a flavorful marinade. A handful of fresh herbs plus garlic and citrus juice transform a plain old piece of chicken into something spectacular. 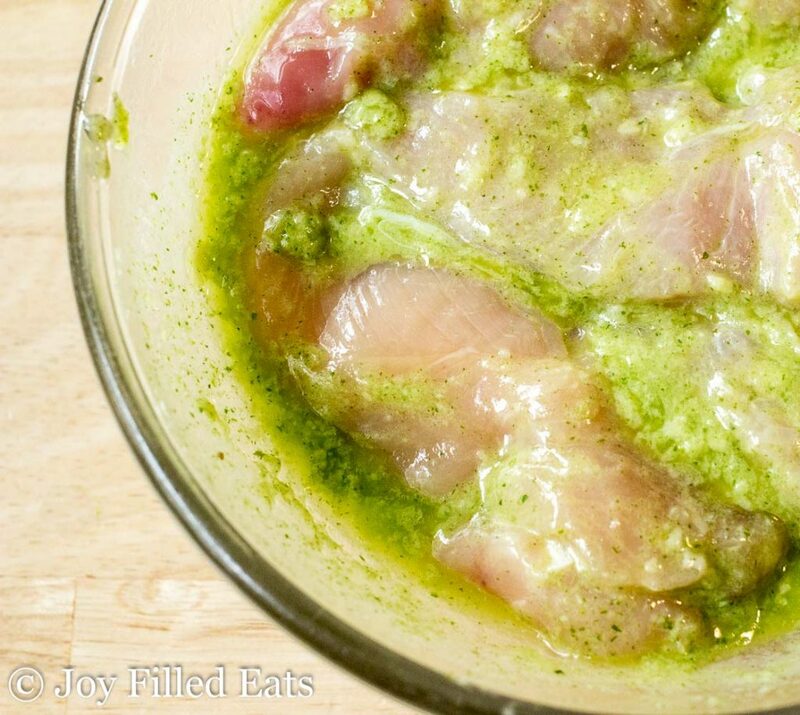 This Cilantro Lime Chicken Marinade will become a staple as quickly in your kitchen as it has in mine. A couple years ago I suddenly had a huge area of my garden full of cilantro. The summer before I had planted a cilantro plant which went to seed. It’s a good thing no one in my family is anti-cilantro. Cilantro seems to be a love or hate herb. To some people, it tastes soapy. To others, it’s fresh and flavorful. 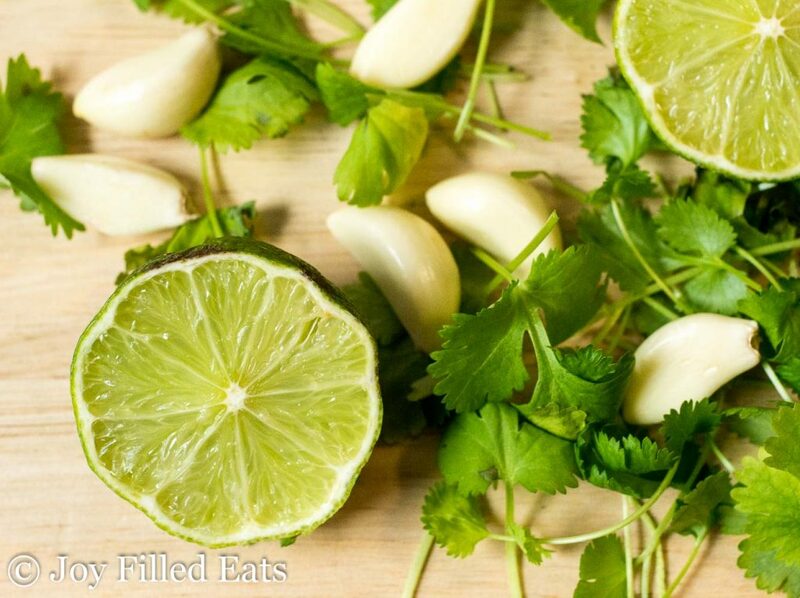 We love to use it as a garnish for Mexican food, in dips, and with chicken. 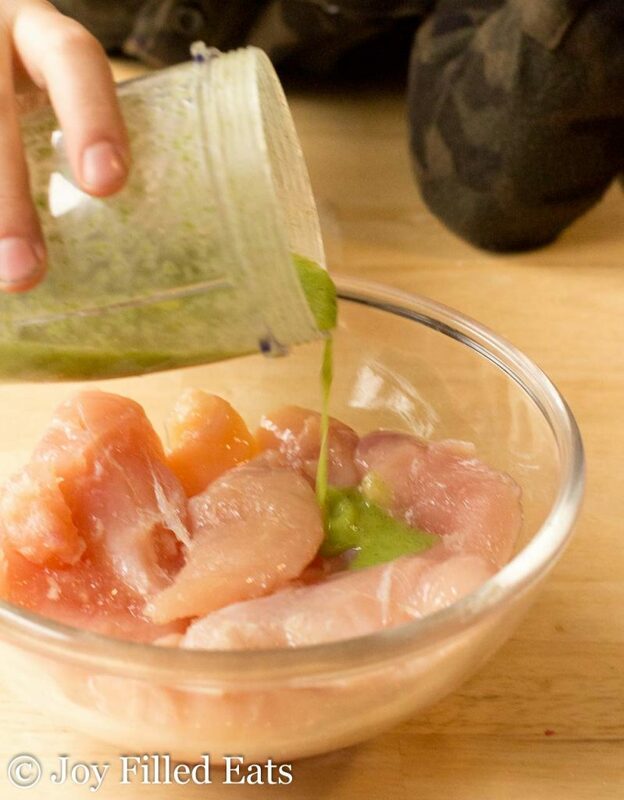 You can take this simple Cilantro Lime Chicken Marinade recipe and swap out the type of citrus juice and which fresh herb you use. The combinations are endless. Just keep the same ratio of oil to acid and almost any combination can work. Using garlic is a must in my opinion. But if you’d prefer to use chopped onion or shallots go for it. Trying to feed my large family on a budget means that I buy things in bulk when they go on sale. Whenever I find chicken tenderloins cheap I buy all of them. They are sized perfectly for small children and are harder to overcook than a large chicken breast. The tenderloin is not just the larger chicken breast cut into pieces. It is a smaller piece that behind the breast. It lives up to its name and really is more tender. 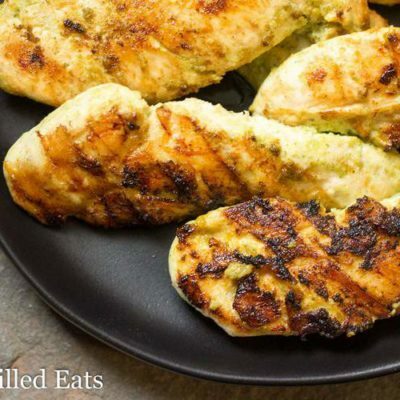 They tend to be a little more expensive than chicken breasts but don’t require any extra effort cutting off fat or pounding to make them cook evenly. 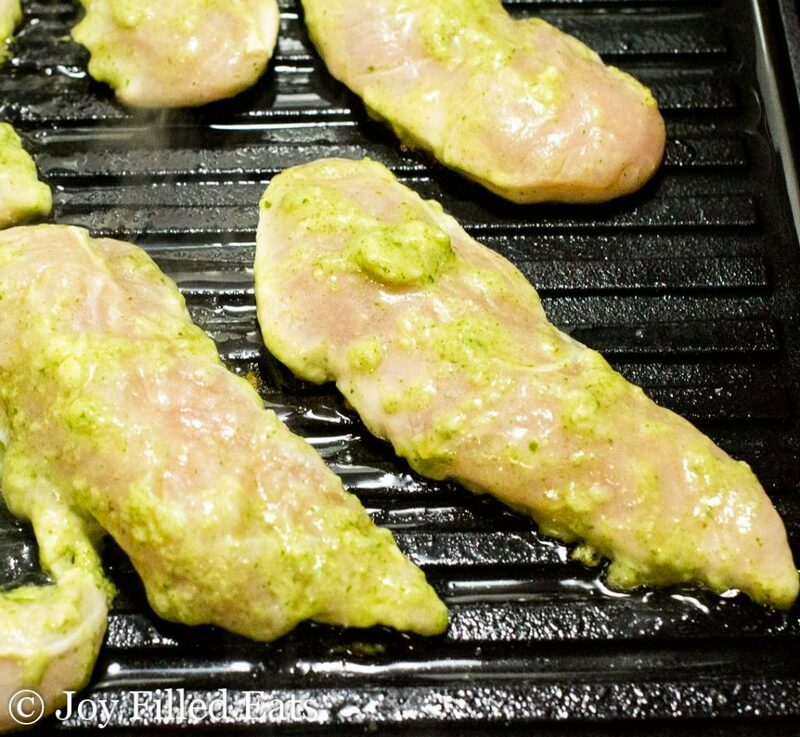 When I stock up on chicken tenderloins I like to freeze them in a marinade to save on prep time later on. Just put some tenderloins into a storage bag and dump in the Cilantro Lime Chicken Marinade. Pop it into the freezer and when you are pressed for time just thaw and cook. I also use chicken tenderloins in my Stuffed Chicken with Asparagus & Bacon, Tuscan Chicken Casserole, Five Minute Garlic Parmesan Chicken Tenders, and Bacon Wrapped Chicken Tenders with Ranch Dip. 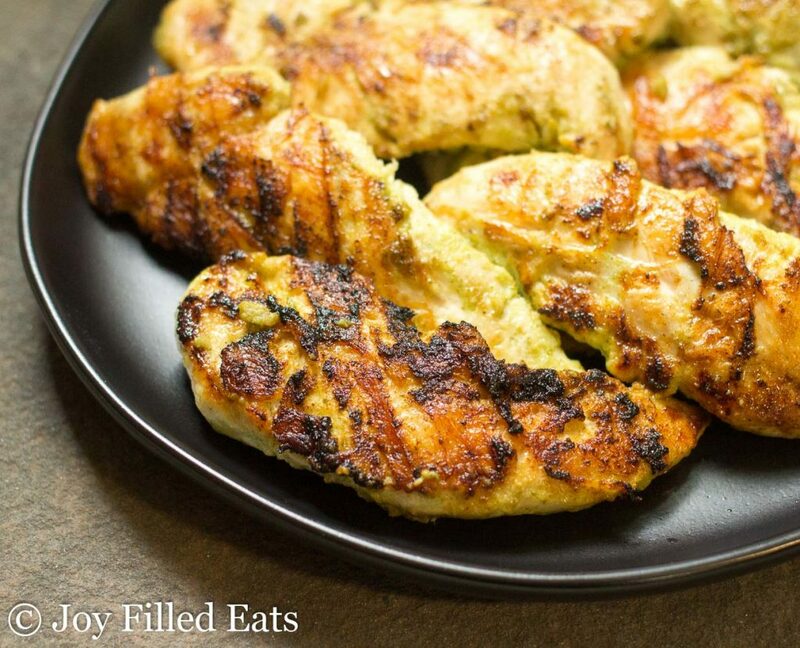 Chicken marinated in my Cilantro Lime Chicken Marinade works well on an outdoor grill, on a grill pan inside the house (like you see in my photos) or just pan seared in a skillet. 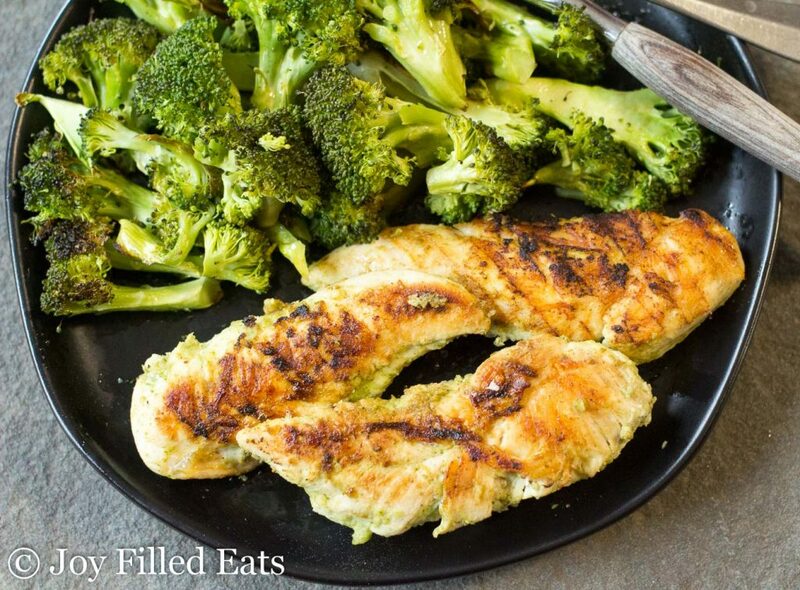 I hope you enjoy this Cilantro Lime Chicken Marinade! 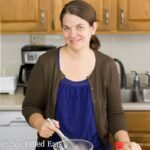 Combine all ingredients in a small blender or food processor and process until smooth. Use to marinate 1 pound of chicken. This makes enough marinade for 1 pound of chicken, approximately 4 servings. The nutrition facts are for 1/4th of the marinade. Looks absolutely delicious, must try it. This looks amazing, I can't wait to try it! I would like to make a larger amount Can it be refrigerated or frozen? I think it would freeze fine. I've frozen chicken in this marinade before. I wouldn't keep it in the fridge for more than a week or so. I'm one of those people that absolutely love cilantro! I wish I could grow it in my garden here in Florida but the heat always seems to kill it (even when it's in the shade!). This marinade sounds so good in all it's combinations that I'm pinning it so I can look it up whenever I want to grill chicken or pork chops. And I learned something today too - you can freeze chicken right in the marinade - woohoo! Thanks for the great recipe! I love all that bright cilantro flavor here. Simple and delicious. How long do you marinade the tenderloins for?